Road cycling is an enjoyable and healthy pastime. You can cycle for various reasons: to avoid traffic congestion on your way to work or school, to get some exercise and keep fit, for environmental reasons, or maybe just to save money on transport costs.Whatever the reason you cycle it's definitely a healthy option. Getting children interested in cycling is a good way of making sure they get regular exercise. It's important that they get cycle training, are aware of the dangers and know road safety before cycling on the roads. Cycling regularly will improve your overall fitness. It improves general muscle function. Your strength and stamina will increase. Cycling gives you a good workout without putting excessive strains on any joints. Your resting pulse is lowered. Blood fat levels are reduced. Cycling is a great way to get fit for people who have never taken exercise before or who haven't exercised for a time. Cycling can help alleviate depression and reduce stress. Cycling is also a great social activity. The whole family can go out and ride together, or even go on cycling holidays. You can ride on your own just to get out in the fresh air. You might even enjoy it so much you start training to compete in road races. You have to be aware that riding a bicycle on the road can be hazardous especially if you are new to the activity. Even if you are extremely competent, other road users might not be as safety conscious or aware of the dangers as you, so you should always remain alert when on the road. Every cyclist no matter how competent should know and follow the basic skills for riding on the road. Cycle training though primarily aimed at children teaches all the skills needed to cycle on and off road safely. There are three levels of National Standard Cycle Training. Level 1 - Beginners age 7-8 teaches basic skills, balance, manoeuvre and control, and is held off road. Level 2 -Age 9-10 the cyclists are given an introduction to cycling on the road. These are held on quiet low level traffic roads, where the children, normally in groups, will learn to observe traffic, how to position themselves properly on the road, signal, turn, manoeuvre and a basic understanding of the Highway Code. Level 3 - Advanced cycling for ages 11-12. This teaches skills required to make longer journeys, and is held on busier roads. It helps them with techniques to handle all road conditions such as traffic lights, roundabouts, junctions and multi lane roads. Don't ride on the pavement. Think ahead; anticipate other road user's actions. Walk across a pedestrian crossing with your bike, don't ride across. Don't ride the wrong way along one-way-streets unless there is a sign allowing you to do so. Ride clear of the kerb. 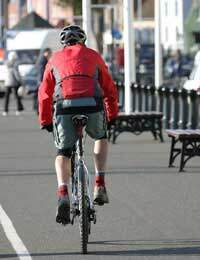 Be visible-wear bright or reflective clothing. Don't ride a bike without lights. Always use your lights after dark, or in poor visibility. Check your bike regularly for defective tyres, lights or worn brakes. Replace any that are faulty. Always look and signal before you start, turn or stop. Don't ride two abreast if it's holding up traffic. Now that you know what's required of you on the road get on your bike and start to feel the benefit.